Home / TOP STORY/ $ 1 b Colombo financial city to kick off in Oct.
Minister Ranawaka says international financial city to be inaugurated on 18 Oct.
CIFC to be located on 6.8 ha of land that belongs to Govt. CIFC is integral to Government plans for its share of the 269 hectares of the Port City project. Minister Ranawaka outlined plans to inaugurate the project on 18 October while addressing an event in Welimada yesterday, a statement released by his Ministry said. “There were huge protests against the Port City when we came into power. There were disagreements over security, environmental problems and even sovereignty issues because of the ownership of land by a Chinese company. However, we successfully resolved all those problems and ensured that the land would only be given on a 99-year lease. We also ensured that there would be more green spaces, residential areas and beach for the people of Sri Lanka to enjoy. As part of these efforts, work on the Colombo International Financial City will begin on 18 October,” he was quoted as saying. The greening measures for the Port City, including the planting of trees, will be rolled out during the next one and a half years, Ranawaka assured. He also pointed out that due to the $ 1.4 billion Port City project Sri Lanka was able to attract its largest ever Foreign Direct Investment (FDI) and benefit from knowledge transfer due to the venture. “Now we have engineers who know how to reclaim land from the sea. This is a new achievement for us and it was learnt by Sri Lankans as part of the Port City project. We will begin initial construction of Port City buildings next year and we are open to investment from any country. Anyone is welcome to become part of this project. We are already formulating plans to construct a state-of-the-art hospital, an international school and large convention centre on the land allocated to the Government. The Chinese company will construct a building that will enable us to attract the top banks and other financial institutions to operate in Sri Lanka,” he added. 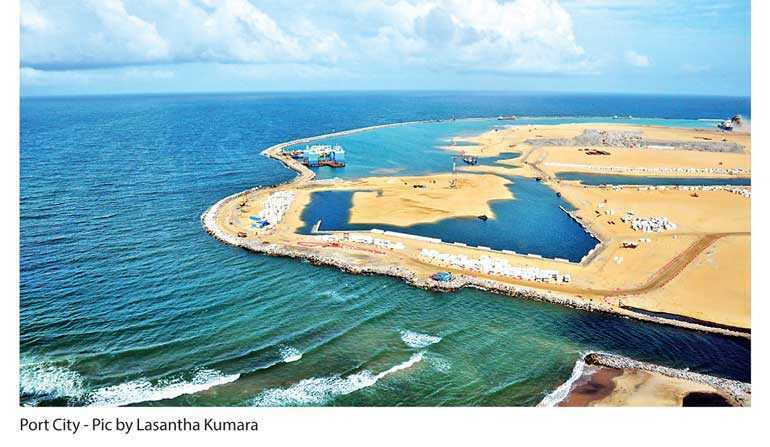 The Government last December approved a proposal to sign a Memorandum of Understanding (MOU) with China Harbour Engineering Company (CHEC) Port City Colombo to develop the CIFC building complex valued at $ 1 billion on reclaimed land. According to the Megapolis Ministry, the building complex will be located on 6.8 Ha of land and entail a FDI of approximately $ 400 million in Phase 1 and a further $ 600 million in Phase II. The Government has also appointed a special committee to formulate laws that the CIFC will function under and is likely to move forward on the proposals next year.